A Colorado attorney has asked a federal judge to order the Transportation Security Administration (TSA) to abandon its airport screening procedures for U.S. citizens. Gary Fielder filed his lawsuit in U.S. District Court in Denver last week, more than a month after he, his two daughters, ages 9 and 15, and a family friend underwent a TSA patdown in San Diego. CBS4denver reports that Fielder’s lawsuit claimed the patdowns were “disgusting, unconscionable, sexual in nature” and in violation of the Constitution’s protections against unreasonable searches. 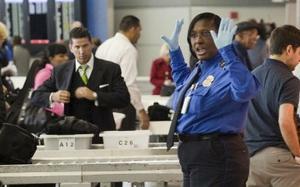 TSA officials last month began phasing in full-body scanners at airports, ahead of the busy holiday travel season. Those who opt out of the scanners, which some travelers oppose over concerns of radiation and graphic images, undergo new patdown procedures that include more of a hand-sliding motion. In a statement, TSA officials declined to comment on Fielder’s lawsuit, citing pending litigation. The lawsuit named DHS secretary Janet Naplitano, TSA administrator John Pistole, and the TSA. The Electronic Privacy Information Center (EPIC) has also filed a lawsuit that challenges the constitutionality of the advanced imaging body scanners and pat-downs currently used by the TSA. EPIC’s suit, too, maintains that these measure violate the Fourth Amendment, which prohibits unreasonable searches and seizures. Portnoy says that an argument could be made that current TSA practices fail the smell test imposed by both lower courts. One particular potential stumbling block to upholding the constitutionality of the full-body scanners is the machines’ capacity, in their present state, to store “naked” images of passengers. As was discovered when EPIC initially filed its lawsuit earlier this year, the U.S. Marshals Service had saved more than 35,000 images from airport body scanners on a computer in an Orlando courthouse. If the court rules that machines can not be considered “minimally intrusive” when they are capable of storing images, the TSA lawyers will have their work cut out for them.